Here at Calls9, we are delighted to have been nominated for not one, but two, prestigious Yorkshire Choice Awards, which ‘recognise local people and independent businesses that are an inspiration in their field’. It really means a lot to be part of an award ceremony which acknowledges all that’s great about business in our beloved county of Yorkshire. You’ll find us sitting proudly in the Independent Business of the Year category, while our Co-Founder and CCO, Pete Mills, has been nominated as Business Man of the Year. These nominations follow on from a successful 2017 for Calls9, when we were shortlisted by Tech North for their Northern Stars Award and by KPMG for their Best British Mobile Start-up. We were also made up to be named by Prolific North as one of the Top 30 Tech Companies to Watch in the North. Since establishing Calls9 in 2011, we have cemented our position as a leading digital solutions provider. We started with 0 users and now our platform, Calls9 Nucleus, has powered websites, apps, intranets and digital experiences for some of the biggest companies in the world and to over 260,000 users. We have recently secured a number of innovative and exciting projects, including teaming up with Hertfordshire-based Tarilian Laser Technologies (TLT), who have developed ViCardio - a revolutionary wearable medical device to monitor blood pressure. According to the British Heart Foundation, as many as 7 million people in the UK are living with undiagnosed high blood pressure. We are developing the accompanying smartphone app for ViCardio and among its many functions, it will allow users to check notes attached to readings, query thousands of records in the system under a second and view past readings for up to 12 months. For Calls9, 2018 is the year of digital transformation and we continue in our mission to help businesses get the most out of digital. Whether it’s launching new digital products and services or improving existing ones. With our help, businesses can digitally transform a whole range of internal and external business processes. We are also excited to have started the year with a series of webinars, exclusive roundtables and our Digital Showcase event - all designed to create a useful forum to connect local professionals in the interest of co-creation and shared knowledge. We are very humbled to be nominated alongside some of Yorkshire’s top businesses, but our success would not be possible without our ever-expanding team, which we continue to grow and invest in. Being nominated for an award doesn’t just recognise the work which goes in to the business from the top, it recognises the hard work, dedication and talent of Calls9 as a whole. As our business continues to expand and excel, we need your help in securing our place at the top at The Yorkshire Awards. If you think Calls9 and/or Pete are worthy of winning their category, then we’d very much appreciate your vote! We’ll find out if we’ve been successful on Friday 13th April - unlucky for some but hopefully not for us - at the Yorkshire Choice Awards Ceremony and Gala in Leeds. Good luck to everyone who has been nominated! 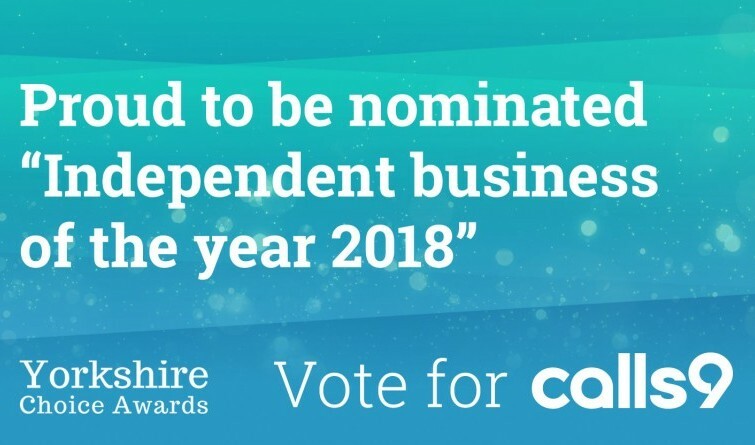 To vote for Calls9 as Independent Business of the Year and/or Pete Mills as Business Man of the Year, simply head over to www.yorkshirechoiceawards.co.uk/votehere and cast your vote by Thursday 15th March 2018.